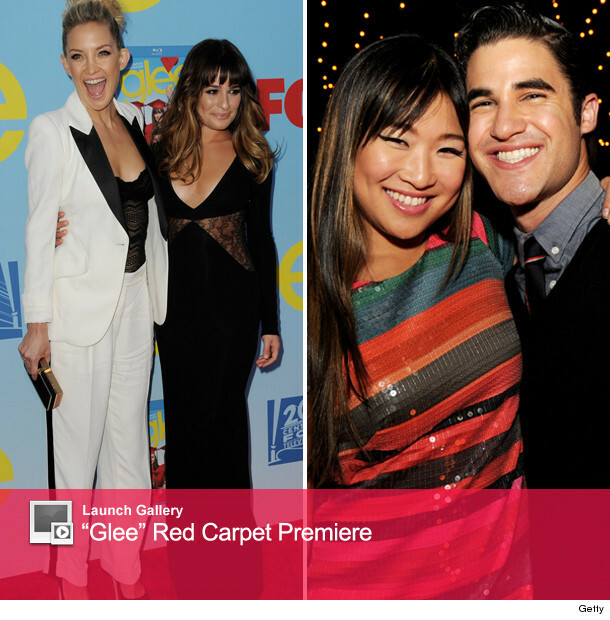 Kate Hudson brought a little extra star power to the red carpet premiere of "Glee" last night in Hollywood. Dressed in a suit with a low-cut top underneath, Kate's white ensemble complimented Lea Michele's daring black dress. It's almost like they planned it or something. While Kate looked great with her cute up-do, we're not really loving Lea's two-toned, ombre locks. What do you think of the look? Also at the event were returning stars Darren Criss, Matthew Morrison, Chris Colfer, Mark Salling, Chord Overstreet, Heather Morris, Jenna Ushkowitz, Vanessa Lengies, Alex Newell and Dot Marie Jones. The crew were also joined by some of the new faces of Season 4, including hottie Dean Geyer, Jacob Artist and Melissa Benoist. Check out all the arrival and party pics in the gallery above. Also be sure to read our review of the premiere here and check out the New Directions singing Carly Rae Jepsen's "Call Me Maybe" below. "Glee" Season 4 Song Preview -- Britney, Bieber and "Call Me Maybe"